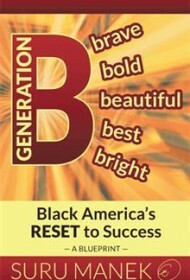 In Generation B: Black America’s Reset to Success, Los Angeles businessman Suru Manek offers his heartfelt prescription for curing what he sees as the ills of African-American life. The Gujuratis, long oppressed by British colonial rule, rose up by their bootstraps, Manek tells us, and he advises African-Americans to do the same: to stop using racism as an excuse for failure, to eschew welfare and to throw alcohol, marijuana and buying on credit (“the devil”) into the ashcan on the way upward. Manek endorses vegetarianism, calls for a dress code (“modest, gracious and elegant”), and praises “business-mindedness.” All in all, he calls for a fundamental change in “the African-American mind-set” that he believes will result in social progress and self-esteem. The conversation about race in America demands many voices. Manek now raises his, and there are good reasons to listen, regardless of a reader’s individual political and social views. He may or may not be a “visionary,” as he claims on page one, but he’s taken great pains to show us exactly how he sees things, through a Gujarati lens.